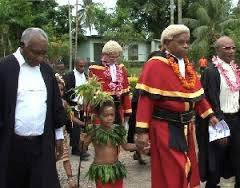 A Supreme Court judge in Papua New Guinea has been arrested and charged with corruption.Bernard Sakora was arrested by members of the country's fraud and anti-corruption squad as he left his Port Moresby home on Monday morning. After several hours of questioning, Mr Sakora was charged with one count of judicial corruption. In a brief statement, the police said the charge was related to a payment Mr Sakora received from a lawyer at the centre of the scandal surrounding alleged illegal payments to the firm Paraka Lawyers. It said Mr Sakora then failed to declare his interest, and presided over a number of Supreme Court cases involving Paraka Lawyers, including that involving an arrest warrant for the prime minister, Peter O'Neill. Mr Sakora has denied the charges.